We all know them – menus to manage our items, abilities and other things. In ORK Framework they’re created using Menu Screens. A menu screen consists of one or more parts (e.g. a list of items, a description box, etc.) – multiple menu screens can be bound together using an overview menu screen to create a complex menu system. Displaying a list of our other menus, some status information of the player group and game information (e.g. time, area, money). Displaying the equipment parts and allows changing the equipment. Displaying the abilities of the player. Displaying detailed status of a member of the player group. In this tutorial we’ll add some new GUI Boxes and other settings, and the first two of our menu screens. Open the ORK Framework editor and navigate to Menus > GUI Boxes. We’ll need three new ones. Copy Top Info and change the following settings. Set to X=0, Y=50, W=400, H=325. That’s it for this GUI box. Copy Menu Small and change the following settings. Set to X=400, Y=50, W=880, Y=750. Set to X=0, Y=375, W=400, Y=325. That’s it for the GUI boxes. Calling a menu screen via input keys (i.e. opening it by pressing an assigned key) can be bound to certain requirements. We only want the menu to be accessible while the player is in control (i.e. outside of events, battles, etc.). Navigate to Game > Requirements and add a new requirement to the list (don’t change the already existing one). Change the following settings. That’s it for the requirement. Since we’re going to display the experience (EXP) status value of our player, we need to set up the settings for it’s value bar display. Navigate to Status > Status Values and select EXP. Change the following settings in the Default Value Bar. That’s it for the bar settings. When displaying menus consisting of multiple controlable parts (e.g. the inventory menu will display a box for the item types and another for the item list), we need to tint the inactive parts in a different color to let the user know which box he is actually controlling. That’s done using the Inactive Color settings. The default settings are made in Menus > Menu Settings. Set to R=0.5, G=0.5, B=0.5, A=1. That’s it for the inactive colors. Tip: You can override the default inactive colors in each GUI box individually. The overview menu will display a list of buttons to change other menus, game information (time, area, money) and the status of the player group. Navigate to Menus > Menu Screens and change the following settings in the default menu. This menu screen will disable the player control while it’s opened. This menu screen will be displayed alone – no other menu screen can be displayed while it’s opened. When not using Single Screen, you can open multiple menu screens at the same time. Calling this menu screen a while it’s already opened (e.g. by pressing an assigned key) will close the menu screen. We want to call this menu screen by pressing an input key. We want to only allow opening this menu via input key when a requirement is valid. Now it’s time to add some parts to the menu screen. Click on Add Menu Part and than on Button List. A button list part will display, well, a list of buttons – each button can be set to do different things, like calling another menu screen. Change the following settings. That’s it for the button list part for now – we’ll add the buttons later, after we’ve added the other menu screens. Click on Add Menu Part and than on Description to add a description part. This part is used to display the description of selected choices – change the following settings. The description box will be displayed even if no description is available. Click on Add Menu Part and than on Information. The information part can use HUD elements to display game information – change the following settings. You can either use an already existing HUD as a template, or add HUD elements directly to this part. We’ll add them directly. The displayed information will be updated over time. The update will happen once per second. Now, click on Add Information Element to add a HUD element. Copy the HUD element and change the following settings. That’s it for the information part. Finally, we’ll add the status information for the player group – click on Add Menu Part and than on Combatant. This part also uses HUD elements to display information. The scope defines the combatants that will be displayed. Now it’s time to add the HUD elements – we want to display the combatant’s name, level, HP/MP, EXP and status effects. Click on Add Status Element and change the following settings. Now it’s time for HP and MP. Click on Add Status Element and change the following settings. Set to % / %n. Now the EXP. Click on Add Status Element and change the following settings. And that’s it for this menu screen for now. We’ll return to it later when it’s time to add the other menu screens as buttons. 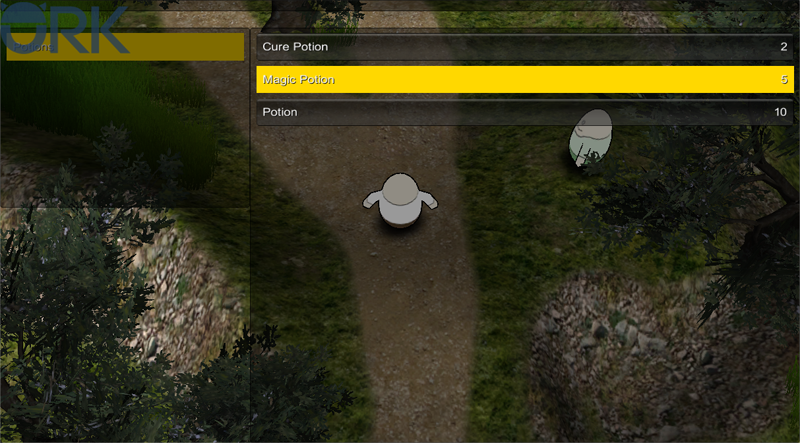 The inventory menu will list all the items in the player’s inventory. We’ll also separate them by type. Add a new menu screen and change the following settings. Now, click on Add Menu Part and than on Inventory to add an inventory part. This part handles everything related to displaying items – change the following settings. The default action allows what’ll happen when an item is selected. The item types will be displayed in their own GUI box. If we don’t have an item of a type, we don’t need to display it. The box display setting defines how the item type and item list will be displayed – the Multi setting will display them at the same time using different GUI boxes. We don’t want to add the money as an item. We’ll display the equipment in the equipment menu, no need to display them here as well. And that’s it for this menu screen. Now, let’s add our first menu to the overview menu. In the Button List part, click on Add Menu Item and change the following settings. Set to Show all the stuff.. If you now press the Menu key (Escape), the menu will open and you’ll be able to select the inventory menu.